Tru here. Been thinking about this a lot in past few weeks, so might as well write about it. i am not a social or psychological professional. These are personal observations from me; just another person (who is driven to collect, analyze, synthesize, and distribute data — as well as any other thing around me). Each of us can chose which side of the penny that we want to SEE on top; to focus on. But if we hold a penny in our hand, then we hold BOTH the “heads” side, and the “tails” side — not one or the other exclusively. For an extreme illustration, food can be wonderful during the intake process … but out-flow of food is a necessary, stinky, messy process. Excrement MUST exist since we are physical animals; ceasing that process means the end of our physical life. 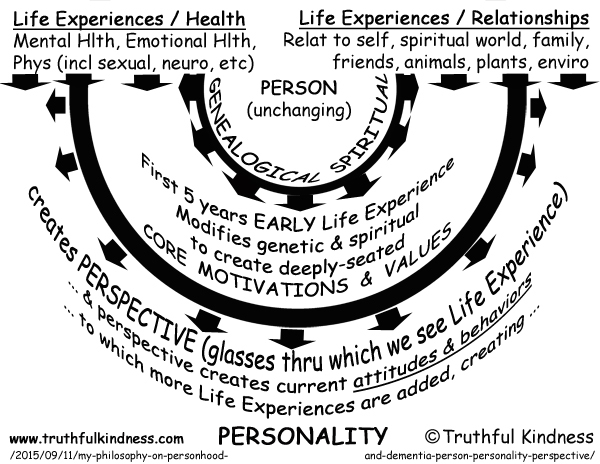 Each person in our life will have aspects that we enjoy, and aspects that we struggle with. Almost always, any single personality trait can produce aspects that are both wonderfully helpful — and also potentially harmful. Will use characteristic of my spouse, Guy, to illustrate this point, since ours is my most primary human relationship at this point in my life. Guy is wonderful at spotting situations that might create future problems. This trait was one of the primary things making him a great Water and Sewer Plant Supervisor, and is important in so many ways for our daily safety and security. BUT, when Guy is under added physical or emotional stress, this same trait can be a struggle for all around. He can take something that (in everyone else’s perception) has very little possibility for being a problem, and go to extreme lengths to make sure we will avoid it. At my core nature i am an analyst. My need to collect, analyze, synthesize, and distribute, is one of my greatest strengths — but it can also be my greatest liability. 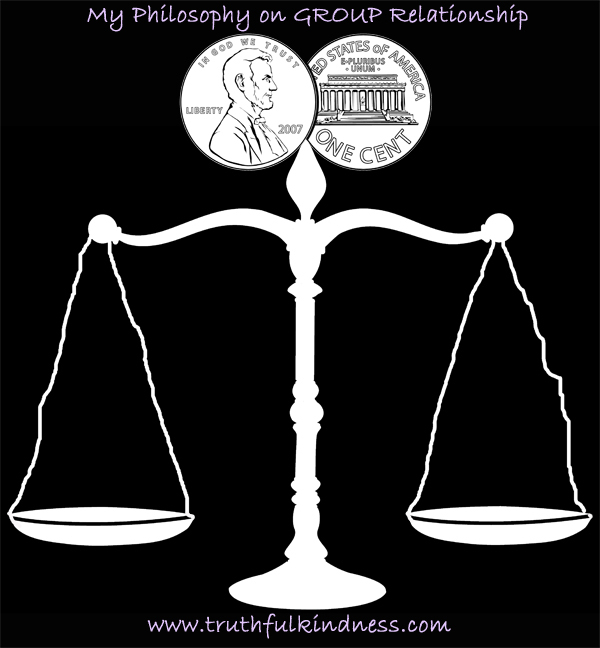 Ask my husband; even Truthfulness, and Loving-Kindness, can at times be a liability, LOL. There is a positive and a negative side to every personality trait. This is even true of animals; Onyx & Snuggle (my chickens), Hero my service dog, and obviously every human … and every GROUP of humans. Sometimes we humans have a tendency to search for that perfect person, or that perfect group of persons, with whom we will have perfect alignment and no struggle … but that is not realistic. in past years i have been in frequent contact with 3 relatives who died with dementia, then part of several dementia groups during these last years. My personal observation is that this can become even more accentuated with age … or with dementia symptoms at any age. The nature of humanity makes it so that there will be benefits AND liabilities in any group of persons – and the more persons involved multiplies each of those possibilities. Any group requires written or unwritten accomodations for needs of other persons, because no two persons have the same beliefs, goals, and interests. But ALL have value. Of course there is the obvious avoidance of super-charged topics like religion and politics, (unless all are in agreement to discuss those topics) but those are not the only potential problems. As one of the Dementia Mentors’ hosts for several years, Following are some of the conversation problems folks have approached me with in the past. 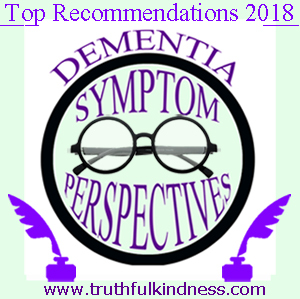 DIAGNOSIS, SYMPTOMS, MEDICATION, AND PROGNOSIS: Some folks really want intense talk about symptoms, and i think all would agree that conversation about these aspects of life with dementia should be an important aspect of discussion among folks who all have dementia symptoms. But taken to the extreme this can be desire for validation of worry, or desire for pity party, which is usually not healthy. On the other extreme are those who desire VERY little talk of these aspects; avoiding these topics allows the UNSPOKEN undercurrent of common challenges … but mostly talk of “fluff”, which helps keep their mind off the worry of their own symptoms and prognosis. Also there is the concern for misunderstanding; that what is said could be taken as “medical recommendations” or “legal recommendations”, which should not be the case, and is actually dangerous. So “dementia” conversation is of primary importance, but has potential to un-balance the balance-scale of comfort level for some participants. ENTHUSIASM & SPEED: Some folks jump right into conversations (like exuberant family dinnertime conversation, when it can be difficult to get a word in edge-wise without interupting other family members) so very informal group is great for them. But quiet, contemplative persons might feel unwelcome to speak unless there are rather prolonged times of silence (which, with enthusiastic, talk-loving group hardly ever happens). Those persons prefer a bit more structure, with specific time for each person to speak, which in turn, can be very uncomfortable for some, feeling put on-the-spot with that structure. Sometimes it may be of the most benefit to have a more intimate, small group, so that everyone has a chance to speak. So enthusiasm and speed of conversation has potential to un-balance the balance-scale of comfort level for some participants on all sides. ADVOCACY: Some folks strongly want a place where they can speak about their latest advocacy project; what is going sour on it and what is going great, because maybe their enthusiasm and hope for any specific project is really what drives them and gives them purpose to continue life after diagnosis. Others may be very uncomfortable with topic of advocacy, because either they feel be-littled for not having an advocacy project themselves, or because they have had conflict with the group associated with that specific project, or maybe they feel talking about a specific project is “tooting their own horn” and they wish to avoid perception of self-centered-ness, or maybe they simply have no interest in dementia advocacy. So advocacy conversation has potential to un-balance the balance-scale of comfort level for some participants. TRAVEL: Some folks are very interested in travel … others are not interested at all. Still others strongly resent the fact that they have lost the ability and/or funds to make travel possible. For those persons, travel-talk is very unhealthy. So travel conversation has potential to un-balance the balance-scale of comfort level for some participants. FOOD: Everyone has some interest in food. Some folks feel strongly about food, but can be sensitive topic. Some members may be vegetarian, and feel almost-nauseous about topic of meat (especially hunting!). Some members may have strong food restrictions, and may be attending specifically to take their mind off their desire for food in general, or a specific food. Several members have lost the ability to taste almost all food, and again it is possible that could become source of resentment (altho that is one of the few complaints i have not yet heard from a member, and the possibility did not even occur to me until just now). So food conversation has potential to un-balance the balance-scale of comfort level for some participants. ADDICTIONS: Talk of any other potentially-adictive substance or behavior can be a possible problem, depending on the challenges of those in attendence (which may or-may-not be publically known). Some of my own absolutely-no-interest topics are sports and television (no television in the homefor >25yrs), but someone else’s could be animals, or crafts. So, again, almost every conversation has potential to un-balance the balance-scale of comfort level for some participants. I frequently mention how life is like a balance beam scale, and i see group dynamics in much the same way. So, personally, when i host a group of persons living with dementia, i try to avoid religion and politics, but if we avoid ALL the above potentially-problematic topics, then even much of the “fluff” topics are removed … and it is not a very meaningful group. For me personally, even aside from religion, politics, and my specific food restrictions, despite interest in the specific person talking, after 3 minutes talk of weather, sports, or television … there are a few dozen other things that i remember i really need to do … or simply want to be doing. Those times it takes self-discipline to stay in chat. For me personally i would like a little less “fluff” and more intimacy in my conversations. i want to hear what each person THINKS or FEELS about any specific topic — even if it is extreme “fluff” like the weather. Then, how is the current weather impacting their symptoms – their relationships, their well-being. I couldn’t care less about the generalities; personally i crave the specifics to better really KNOW that person i am in relationship with (thru the group). But many folks are uncomfortable with verbal intimacy. I need to keep reminding myself that my own needs and wants are far from top priority in group conversation. So, unless instructed differently i think the other topics very permissable for SHORT periods of time (5-10min). And talk of symptoms is practically unrestricted (except for making recommendations, or trying to “diagnose” another person without medical credentials and physical exam, which, like fear-mongering, are never ever permitted). Again, that means host needs to be watching body language of attendees to make sure no member is feeling uncomfortable with topic — fidgeting, or avoiding eyes, or unusually distracted. If so, then i try to guide conversation to some alternate topic. I might ask someone who has not spoken much if they are comfortable sharing what is going on in their life, or share something new myself to change topic. I often wish i had a list of possible alternate topics posted on side of my PC, along with my “cheat sheet” of nouns and names that are simply missing from my brain. The same is true for folks who might be trying to speak. i try to keep an eye on all members and if they open their mouth then close it again very many times, or show other body language that might indicate desire to speak, and conversation continues to flow over and around without giving them that opportunity, then i might wedge myself in, and ask if they wanted to say something, because otherwise they are likely to lose their train of thought (ie having productive input to group conversation). There will always be some amount of tension within any group of persons, even between person living with dementia and their partner in care, … and even within ANY family, or any group of persons living with dementia. That tension is part of each person being a different person, with different personality, history, goals, and challenges, … so we can only do our best to minimize that tension. Just like any personal relationship, there inevitably WILL be negatives. … We need to CHOOSE whether we focus on the “heads” or “tails” of the group relationship. Since i was a child, as someone who requires very high protein for body health (along with low toleration of legumes such as soy) my perspective has been to “eat the meat and set the bones (negative aspects) to the side of my dish”. Those negatives still exist, and it is important for health to acknowledge the “bones” and make accomodation in a safe, healthy, manner … but do not allow the “bones” to prevent the beneficial aspects of the food. I thought of it many times when i was in school classes as a child, then dealing with the various negative aspects of adult life, and it is very important in all group relationships. * Admin issues: SHARE dementia awareness thru buttons below. Feel free to leave your thoughts in the form of comments, but please filter your comments with truthful loving kindness to all concerned. If interested in receiving notice of future blog postings, subscriptions are available through a “follow” button in the upper left corner (MS Explorer) or lower right (Safari, Mozilla Firefox and Chrome). If there is an advertisement below, I have no control over what is shown. My own full legal name is Truthful Loving Kindness. My current diagnosis is still Mild Cognitive Impairment, but my neurologist said I am in a unique position for helping because I have “one foot in each door”. Text Copyright © 2018-07/17 txt was 4hrs on Jul11 + 6 hrs on Jul17 (w/help from husband) + 1hr for graphic. Tags are: dementia, group, PLwD, relationship. This entry was posted in Communication, Important, Journal, Relationships and tagged dementia, group, PLwD, relationship. Bookmark the permalink. Insightful, Tru, as usual. Your writing still remains clear, concise and informative. I always find food for thought in your writings and am grateful for them. A brilliant and insightful observation of many group relationships. I found this to be an extremely interesting and thought provoking subject, one which I hadn’t thought about.